SOUTHINGTON- The Rotary Club is donating $100,000 toward a new playscape at Memorial Park. 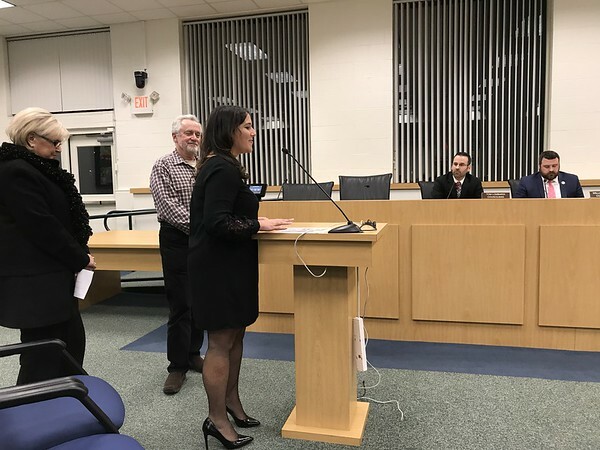 The announcement was made at Monday’s Town Council meeting by Rotary member Kate Sirignano, who said it was Southington Rotary’s largest capital campaign undertaken. Town Council member Dawn Miceli said the whole project will cost $200,000. It will replace the existing playscape, built in the 1970s. Miceli said the project will take about two years. The new playscape will have a rubber surface instead of wood chips. It will have 39 components for different ages including a pirate ship. The new playscape will be moved to between the swimming pool and fields. It will be adjacent to the parking lot. The town is also pursuing a $50,000 grant. In other business, the council voted to approve a fully grant-funded improvement to the West Street and Jude Lane intersection. Southington Director of Public Works Keith Hayden provided an update on upcoming projects, including the intersection. The intersection renovation will begin construction early next spring. The $676,000 project will add a left turn lane and a signal with a green arrow. The Farmington Canal Heritage Trail from Lazy Lane to the town line, Hayden said, has entered the final design phase. The $3.3 million project is 80 percent state funded and 20 percent state funded. The Spring Street Bridge over the Quinnipiac River is expected to begin construction in the spring. A public hearing will be held Feb. 20 in the Municipal Center. This $2,477,000 project is 80 percent federal funded and 20 percent town funded. Council Chairman Chris Palmieri said that it is “incredible” that “all this work is being done” at little to no cost to taxpayers. Hayden said that his department “aggressively pursues” grants. The town is also in negotiations for a $1.2 million fully-funded replacement of the Marion Ave. Bridge over Falls Brook. The safety upgrades to Plantsville Center, a $2.5 million project, is expected to begin construction next spring. It is currently under review by the Capitol Region Council of Governments. The $13.8 million state mandated phosphorus reduction upgrades to the Water Pollution Control plant have begun and will be completed in 30 months. During Councilperson Communications, Councilor John Barry congratulated Police Chief John Daly for 35 years of service to the town. Palmieri acknowledged John DeMello of the town’s Veterans Committee who was recognized recently as the Southington YMCA’s Person of the Year. “The work our veterans committee does for the community is unparalleled,” he said. Councilor Chris Poulos said that the Southington Historical Society is working to renovate its lower level. They have spent $4,000 to purchase two commercial-grade dehumidifiers to deal with moisture issues and removed old sheet rock, panels and carpeting. HQ Dumpsters donated a dumpster to use for this prohibition and public works staff have also lended their manpower to help. Posted in The Bristol Press, Southington Herald on Monday, 11 February 2019 20:36. Updated: Monday, 11 February 2019 20:38.